Here is a new take on an old favourite. Hark! The Herald Angels Sing is arranged in a jazz swing style. 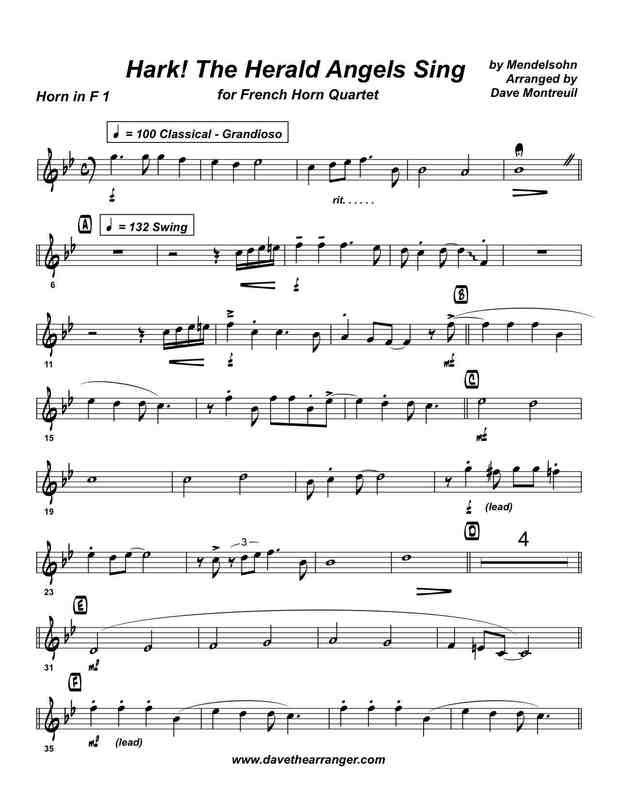 Happy, strong, up-beat and confident all come to mind when describing this French Horn Quartet. Adding some percussion can only make Hark the Herald better. This could be as simple as hand clapping on beats 2 & 4. Hark! The Herald Angels Sing for French Horn Quartet is a touch on the range-y side. The first horn play up to a G on top of the staff (see sample below), while the 3rd horn goes down to a D below the staff. A piece perhaps not for beginners, but certainly playable by university level students. Perfect for buskers or friendly christmas quartets.